BLOG: Tossing the Garter. Yes or No? Tossing the Garter – Yes or No? One of the potentially more embarrassing traditions at weddings is the tossing of the garter. Well, not the actual tossing, but the process of retrieving the garter from the bride’s leg. This can be done quite discreetly, but often isn’t! For this and other reasons a growing number of couples are choosing to skip the garter toss altogether. But skipping the embarrassing bit (the retrieval from the bride's leg) and changing up how it is tossed can add a lot of fun to the occasion while avoiding the things that can be an issue . The roots of the garter-toss tradition lies with the belief that bits of a bride’s wedding dress would bring luck, so guests literally tore the bride’s garments to pieces. That changed when someone had the bright idea of throwing the bride’s stockings to the mob, and eventually as notions of acceptable social behaviour became more restrained, that became the garter that held her stockings up. Separating the toss from the retrieval opens up all sorts of creative (and inclusive) possibilities. Schedule a wedding anniversary eliminate dance rather than have singles line up to catch the garter. Get them all onto the dance floor and have the DJ or MC call out lengths of marriages – starting with a couple of months and working up in years, with couples leaving the dance floor as their time period is called. When you're down to one couple (if presenting only the garter), or two couples (if presenting both the garter and the bouquet) have a formal presentation from the newest married couple (the two of you) to the longest married couple(s). Play a version of pass the parcel, with the garter as the prize. This is a game that can be stretched out because where the parcel stops when the music stops is the next person to take a layer of wrapping off, so you can have quite lengthy pauses. Perhaps intersperse the speeches with passing the parcel a couple of times. This would be a great way to reuse wrapping paper saved from engagement wedding gifts and wedding gifts delivered before the big day. Blow up a number of large opaque balloons and hide the garter in one of them, and some ribbons and a card that says “Sorry!” Release the balloons and watch the fun begin as guests catch and pop balloons to find the garter. NB this only works if the balloons really are opaque. You don't want the silhouette of what's inside the balloon to give the game away. 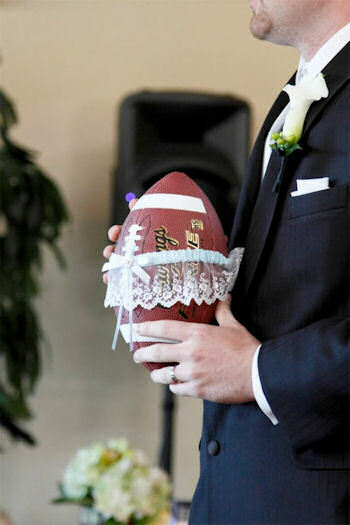 Put the garter round a football, a Frisbee, a quoit, or something else designed to be thrown. Toss it and watch everyone leap to catch it. An added advantage is that the thrower has more controller over where it goes and how far it goes.